“Almost Home” is an original acrylic painting purchased at live auction for $10,000.00. 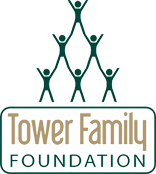 Limited Edition Lithograph Prints, that are signed and numbered by the artist, are available exclusively from the Tower Family Foundation and are suitable for framing for display in your home, office or lobby. The concept for a work of Tower Art was actually conceived when a Tower Climber snapped a still photo of his partner at the end of a long days work. This theme was developed and presented to famed artist Joanne Shellan as a commissioned project. Joanne did a remarkable job of capturing the sunset colors and the feeling of fatigue that a climber experiences at days end. 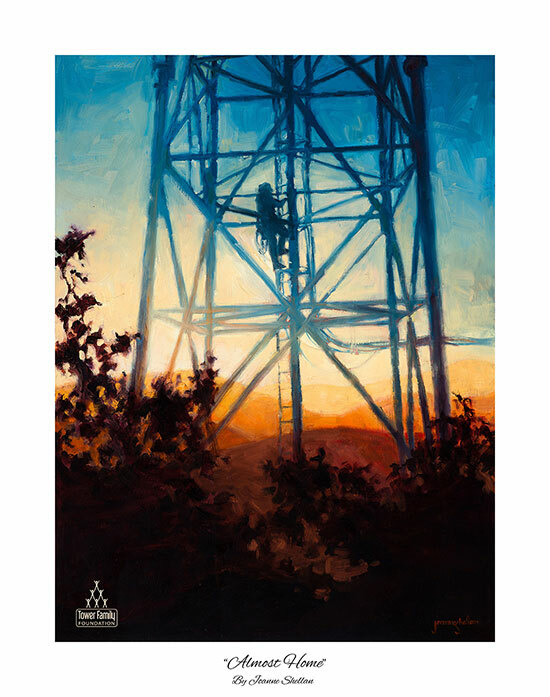 Toward the end of the paintings completion, the commissioner named the painting “Almost Home” based upon the knowledge of what it really feels like to descend a tower at days end, safe and sound. Joanne Shellan is a renowned artist who has garnered attention from collectors, galleries and exhibitions. Her awards include selection to represent Washington State in the Governor’s Mansion and almost 2 dozen solo shows. ALL proceeds from the “Almost Home” print sales (with the exception of shipping costs) will be donated directly to support tower climbers and their families. * Please Note: The online order form is not equipped to process international transactions. Individuals interested in purchasing an “Almost Home” print who reside outside of the United States may contact help@towerfamilyfoundation.org to receive specific instructions on how to order the print.